Diabetic retinopathy is one of the ocular complications of diabetes, an illness that affects the body's ability to control its blood sugar levels and to which the retina is particularly sensitive. Diabetic retinopathy is caused by deterioration of the retina 's blood vessels. These altered vessels can dilate allowing fluid to escape and can even become blocked, cutting off the blood supply to part of the retina. If the illness is allowed to advance, new blood vessels form, proliferating fibrous tissue in the retina and causing the eyesight to deteriorate. When diabetic patients also have other risk factors such as high blood pressure, obesity, high cholesterol or tobacco use, the risk of suffering from ocular complications multiplies. That's why patients affected by diabetic retinopathy must be highly disciplined in looking after their general state of health, diet and weight, as well as not smoking. Among other symptoms, diabetic retinopathy leads to increasingly limited eyesight due to macular oedema secondary to diabetic retinopathy. Macular oedema, which is the inflammation and accumulation of liquid in the macula, occurs when the retina's blood vessels leak and reduce the central vision. This is usually painless and few symptoms may be noticed at the beginning, principally blurred, faded vision, although it's necessary to treat this in good time to avoid irreversible degenerative changes. Sometimes this illness starts with an acute intraocular haemorrhage which results in the sudden appearance of dark patches that obscure vision partially or totally. Many people with early diabetic retinopathy have no symptoms even though complications may be gradually developing. This is why everyone with diabetes should have regular ophthalmological check-ups to prevent avoidable complications in good time. A thorough ophthalmological examination is crucial, which also includes the following tests: a retina scan, optical coherence tomography, fluorescein angiography unless the patient is allergic to fluorescein, and visual field campimetry. Those with the earliest forms of non-proliferative diabetic retinopathy may not require any treatment. 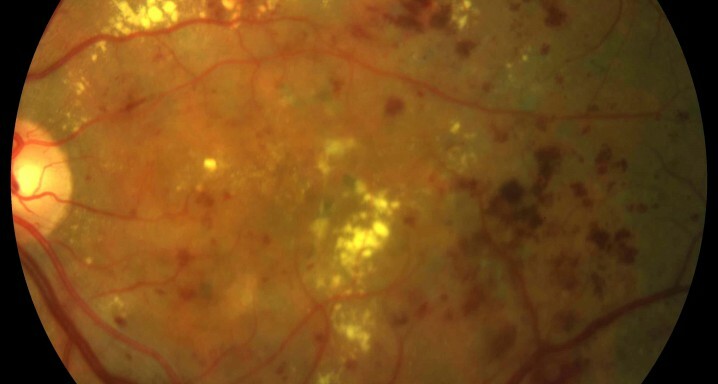 Some patients affected by very slight diabetic macular oedema without any symptoms may only require the condition of their eyes to be regularly monitored. In other cases intravitreal injections are required of angiogenesis inhibitors or sustained release corticosteroids, or a combination of both, to control the diabetic oedema, restore sight and prevent loss due to irreversible degenerative changes in the fine cellular layers of the retina. On very limited occasions laser photocoagulation may even be recommended close to the macular zone, carried out selectively on microaneurysms to reduce the oedema. When the illness shows signs of progressing to a proliferative form, extensive photocoagulation becomes necessary on areas without a blood supply (ischaemic) to avoid progression to these stages with a high risk of serious complications. Not having this treatment due to a fear of laser treatment is a serious error that can result in irreversible situations. In advanced cases, with intraocular haemorrhage and/or retinal detachment, it's necessary to resort to advanced intraocular keyhole surgery, carried out under local anaesthesia. Laser and different keyhole surgery techniques are highly effective procedures in treating diabetic retinopathy that allow us to resolve very desperate situations. However, the ideal situation would be not to reach such extremes by preventing complications in the first place. Anyone affected by diabetes mellitus must not only keep strict control of their general state of health but must also have regular ophthalmological check-ups, even when they don't have any symptoms. Prevention and early diagnosis improve the visual prognosis of the illness. This is not merely a truism. Nowadays most patients can avoid reaching extreme situations of high risk. However, it is vital to have regular preventative examinations. There are few illnesses where prevention can be so effective. The Institut de la Màcula has state of the art technology to diagnose and treat diabetic retinopathy and to monitor its progression in already diagnosed patients. The Institut uses cutting edge MicroPulse technology, an excellent application in some cases of diabetic macular oedema. This technology uses very low-level laser therapy with a short, repetitive pulse rate lasting just millionths of a second, that results in a safe, effective method to treat diabetic macular oedema, avoiding or delaying in some cases the use of intravitreal injections.